The U.S. Supreme Court, with one vacant seat, heard oral arguments on Wednesday in what is widely believed to be the most consequential reproductive rights case since Roe v. Wade, one which observers warn could dramatically alter abortion access for women across the country. “The Supreme Court, and this nation, is at a crossroads,” Ilyse Hogue, president of NARAL Pro-Choice America, declared Wednesday ahead of the court hearing.The case, Whole Woman’s Health v. Hellerstedt, questions whether a Texas law that set stringent requirements for abortion clinics, with the intention of forcing the shutdown of women’s health providers, is actually legal. Observers say that a high court ruling on the law could set a binding precedent as similar Targeted Regulation of Abortion Providers, or TRAP, laws have been implemented by Republican governments in a number of states. The Wall Street Journal provided live updates on the court hearing Wednesday. The law, HB2, has already forced the closure of more than 40 abortion providers in Texas, and is poised to leave the nation’s second-largest state with 10 or fewer clinics. It stipulates that clinics meet the standards of ambulatory surgical centers, where outpatient operations are performed, and requires that doctors performing abortions hold admitting privileges at a hospital within 30 miles of a clinic. “These sham regulations are designed to do one thing, and one thing only: shut down clinics. And when clinics close, women suffer,” said Nancy Northup, president and CEO of the Center for Reproductive Rights. Following the morning’s arguments, Amy Hagstrom Miller, CEO of Whole Woman’s Health, the lead plaintiff in this case, sent an emailed statement warning against the implications of the case—for women across Texas and the nation. “We’re fighting a harsh, cruel law that does nothing to promote women’s health,” Hagstrom Miller said. The Supreme Court is expected to issue its ruling in the case by the end of June. In the wake of Justice Antonin Scalia’s death, with one vacant seat and thus an ideologically split court, all eyes are focused on Justice Anthony Kennedy as the deciding voice in this case. A deadlocked vote will leave the Texas law in place. However, if Kennedy does not side with the conservative bloc, the decision “will determine the future of abortion regulation,” wrote New York Times‘ Supreme Court expert Linda Greenhouse. The emphasis on women’s health is a reflection of the evolution of the anti-abortion movement during the years since the court, in its 1973 Roe v. Wadedecision, declared a constitutional right to abortion. The movement’s original emphasis on the fetus failed to achieve the goal of overturning Roe either by constitutional amendment or by changing the direction of the court. Groups including Americans United for Life, a strategic and highly effective policy generator for the movement, began to urge sympathetic politicians to invoke women’s welfare as the reason for imposing new restrictions on abortion. Hellerstedt marks the first occasion for the U.S. Supreme Court to examine the legality of TRAP laws. Indeed, according to reporting, much of the discussion during Wednesday’s hearing revolved around whether the spate of clinic closures in Texas is directly tied to the introduction of HB2, which the plaintiffs argue has placed an “undue burden” on abortion. 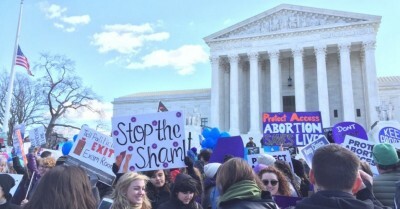 Meanwhile, outside the Supreme Court, women of all ages protested for their right to a safe and healthy abortion with a rally to denounce “sham” laws, like HB2. And for passersby, an interactive, multimedia exhibit was erected this week on the National Mall by the women’s advocacy group UltraViolet showcasing how women “really experience abortion care throughout the country” to show “what’s at stake” with Hellerstedt. Protest pictures and updates are being shared on Twitter under the hashtag #StoptheSham.